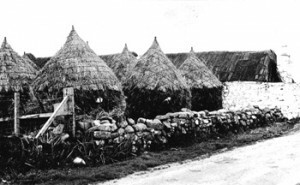 Article from An Tirisdeach: While driving round the island in the last few weeks, it has been interesting to see the crofters working hard gathering in the harvest. Whilst the round plastic wrapped bales that we see may be more practical they don’t have the same eye appeal as the stacks in this picture. Showing that sometimes the traditional and the modern can mix, this photo was taken at Whithouse Farm, Cornaigbeg, Tiree on 1st September 2011. 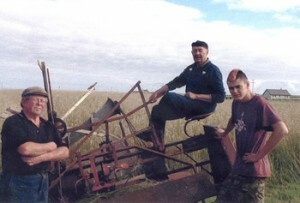 Cutting a field of oats & rye with a J F Binder are Hugh MacCallum of Whitehouse Farm, Donald MacLean sitting on the binder and Donald’s grandson Daniel Hayes, standing on the right.